This landmark volume presents the work of the American Educational Research Association's Panel on Research and Teacher Education. It represents a systematic effort to apply a common set of scholarly lenses to a range of important topics in teacher education. *to propose a research agenda related to teacher education that builds on what is already known and that identifies the research directions that are most promising for the future. Members of the Panel were appointed from various sectors of the educational research community and with different areas of expertise, including teacher education, policy, assessment, research design and methods, liberal arts, multicultural education, and school reform. Building on their diverse perspectives, they ably translated their charge into a series of questions that became the framework for this volume. The questions illuminate many of the issues that have been most contested in past and current discourse about teacher education reform. Studying Teacher Education examines research about the current pool of prospective and entering teachers and about local, institutional, state, and federal preservice teacher education policies and practices. The book includes three general chapters and nine research syntheses. Each chapter reviews the empirical literature and proposes a research agenda that builds on and extends what is known about a topic. A chart at the end of each chapter provides summary information for each of the empirical studies synthesized and two reference lists--one for all of the studies reviewed in the chapter and one for additional references used. The volume includes an introductory chapter on the Panel's context and goals, and an accessible Executive Summary of the book as a whole. 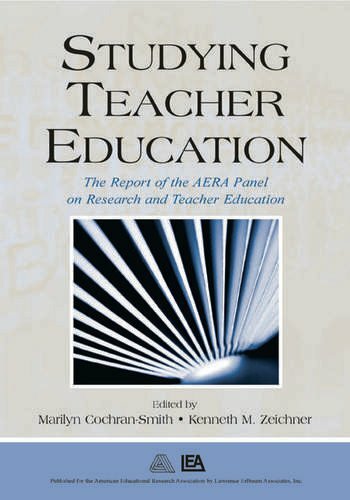 Studying Teacher Education: The Report of the AERA Panel on Research and Teacher Education is a timely, indispensable reference for all researchers and professionals in the field. Contents: Foreword. Preface. Executive Summary: The Report of the AERA Panel on Research and Teacher Education. M. Cochran-Smith, K. Fries, The AERA Panel on Research and Teacher Education: Context and Goals. M. Cochran-Smith, K. Fries, Researching Teacher Education in Changing Times: Politics and Paradigms. K. Zumwalt, E. Craig, Teachers' Characteristics: Research on the Demographic Profile. K. Zumwalt, E. Craig, Teachers' Characteristics: Research on the Indicators of Quality. R. Floden, M. Meniketti, Research on the Effects of Coursework in the Arts and Sciences and in the Foundations of Education. R.T. Clift, P. Brady, Research on Methods Courses and Field Experiences. P. Grossman, Research on Pedagogical Approaches in Teacher Education. E. Hollins, M.T. Guzman, Research on Preparing Teachers for Diverse Populations. M.C. Pugach, Research on Preparing General Education Teachers to Work With Students With Disabilities. S. Wilson, P. Youngs, Research on Accountability Processes in Teacher Education. K.M. Zeichner, H.G. Conklin, Teacher Education Programs. K.M. Zeichner, A Research Agenda for Teacher Education. The AERA Panel on Research and Teacher Education--Biographies of the Panel Members. "The book, intended to assess existing research on teacher education and suggest new avenues for further research, mentions a number of components for educational programs that have show promise in helping students become better teachers." "Studying Teacher Education is a profoundly important book. The editors have brought together a collection of scholars who over the past four years carefully examined nine major topics related to teacher education and academic achievement. The executive summary should be required reading for all policy makers, and a copy of the book should be on the shelves of every education faculty member. Essential." "This volume is one giant step forward for teacher education. It provides wise analyses of the extant research in our field and surely will be the basis for rigorous study of teacher education in the years to come. Taking this volume seriously can guide us from being a profession that believes it is doing good work to one that has evidence that our work is both good and successful." "The AERA Panel on Research and Teacher Education has delivered a clear, hard-hitting report--a must read for serious scholars, educators, and those who seek to improve the quality of teaching in American schools." "This volume represents the most comprehensive, coherent discussion of where the field of teacher education is and where it needs to go. It is a powerful blueprint for research and practice--filled with both critical questions and long awaited answers."